Recently, my friend and fellow blogger Flavia (of Flavia's Flavors) started up a thread on Facebook where she asked other Italian food bloggers/enthusiasts to add to her list of Italian dishes and ingredients with odd names. The more responses I read, the more I realized that actually, Italian cuisine is packed with odd or peculiar names, some of them best not translated. For example: there are pastas whose names in Italian mean things such as "little ears" (orecchiette,) "little worms" (vermicelli,) "priest stranglers" (strozzapreti,) or "little tongues" (linguine) among others (appetizing, no?!) There are also dishes with stranger names, like calzone (pant leg,) the leafy vegetable agretti (friar's beard,) cookies like dita degli apostoli (yes, apostles' fingers) occhi di bue (bull's eye) or baci di dama (lady's kisses,) not to mention spaghetti alla puttanesca (whore's pasta) and spaghetti alla carbonara (coal-miners pasta). While the translations can be a bit strange, I certainly do appreciate the quirkiness of these names and how a few of them must have a story behind them. After all, I can't quite say the same of American cuisine, where the standbys -- chicken and dumplings! apple pie! meatloaf! chocolate chip cookies! -- are terribly self-explanatory, no guesswork about what you might be eating or making to be found. 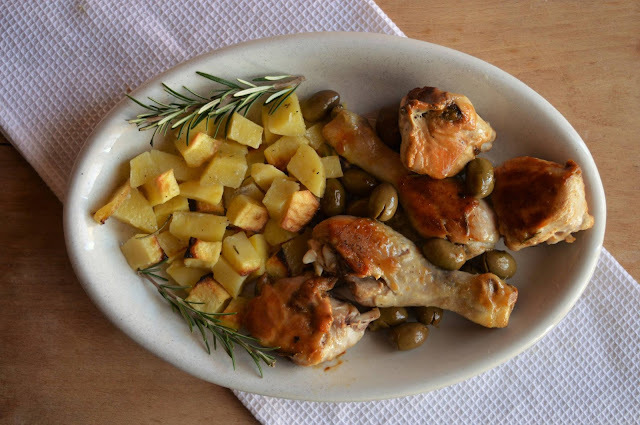 Today's recipe for pollo alla cacciatora in bianco (the “in bianco” part refers to the lack of tomato sauce in this version) is another such dish with an odd name, translated in English to "hunter's chicken." I figured out the translation of this dish's name – what we in the U.S had always called chicken cacciatore – around when I started learning Italian and cacciare (to hunt) was one of the verbs on my vocab list. I found the name instantly charming, reasoning it was called Hunter’s Chicken because it was hearty, filling, just the sort of fare a hunter would want after a long day of, well, hunting, which, I imagined, was a tiring, slightly stressful activity, especially if your livelihood (and perhaps even the livelihood of your children!) depended on it. 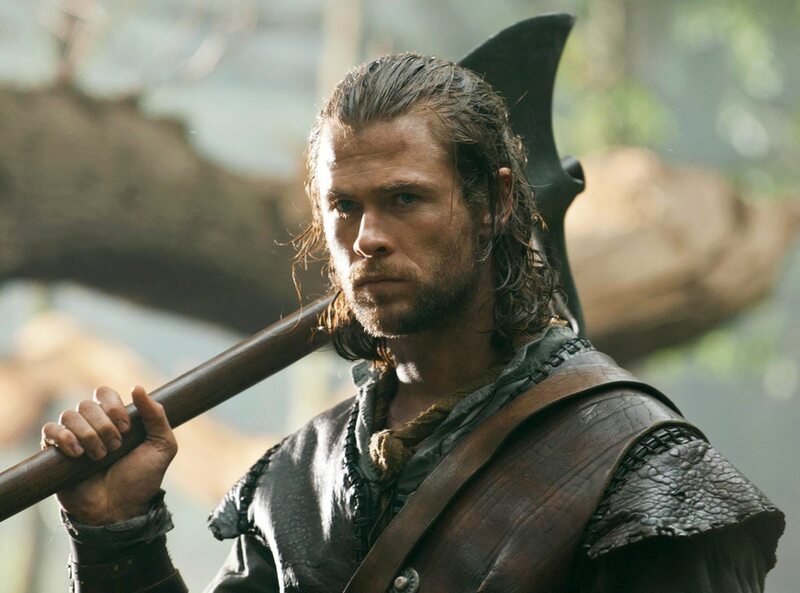 Realistically, I figured that the aforementioned hunter was sort of rugged, graying and bearded probably, weathered and worn around the edges (like I said, hunting must be exhausting) but ideally, I imagined he could also look a bit like Chris Hemsworth when he played a huntsman in that movie with Kristen Stewart, you know, where the hunter looks like this (for Chris Hemsworth, I would make pots upon pots of pollo alla cacciatora). But wait! I realized something else. The name in Italian is cacciatora, which is female. Was the hunter actually a woman, a fierce female hunter with a husband who stayed at home with the kids, a bit of a rebel, gossiped about among the other non-hunter housewives?! This idea also intrigued me, but nearly as much as my next musing, that that perhaps chicken herself was the hunter -- the name does leave room for interpretation -- decked out with a jaunty hunting cap, a bow and arrow, and hunting boots that were a bit too big on her skinny chicken legs. Chickens, of course, are vegetarians and thus would never hunt, but now I've provided you with an adorable mental image -- a lady chicken hunter wearing a tiny cap! -- and so we can proceed on to our recipe. So, the real meaning between pollo alla cacciatora? The sources I've read seem to think it refers to the hunter's wife, who would prepare such a meal as fuel before a big hunt (so I was sort of right). Wikipedia claims that this dish was named after Antonio Cacciatore, a poet, though I mysteriously have found no other sources claiming this, nor can I find any trace of such a man (it is Wikipedia, after all). The origins of the name pollo alla cacciatora may be foggy, but the verdict on this recipe is crystal clear: its delicious and it belongs in your repertoire. Here we've got chicken cooked crisp on the outside and juicy on the inside, ultra flavor-packed after a long simmer in a bath of wine, rosemary, sage, and garlic, livened up with a handful or two of briny green olives as a finishing touch. It was lovely served alongside roast potatoes and fennel, a nice change of pace from my usual pasta, not to mention a quick jaunt outside my carb-heavy culinary comfort zone. Hunter or not, you'll want a big plate of this for dinner this Winter. Looking for other non-pasta, dessert, or overall carb-y dishes? Check out this Salmon with Mustard Glaze, this Salmon with Strawberry and Avocado Salsa, this Chicken with Sweet Potatoes and Peppers, this Swordfish with Tomatoes, Pine nuts, and Olives, these Avocado Cheddar Cheeseburgers, this Saltimbocca alla Romana, this Polpettone al forno, and these Meatballs in Tomato Sauce. Season the chicken pieces with salt and pepper. Heat enough olive oil to generously coat the pan in a large skillet over medium heat and add the garlic. Let the garlic brown a little to flavor the olive oil, then add the chicken, skin side down. Let the chicken cook for a bit, or until the skin is brown and crisp (don't move the chicken around too much or you won't get the skin nice and crispy!) Turn the chicken pieces over when the skin is browned and let brown on the other side too. When the chicken is browned on both sides, add the herbs to the pan, then add the wine. Let the chicken cook for about an hour, or until it is cooked through, adding a bit of broth to the pan as needed if the wine evaporates too quickly, turning the chicken a few times. Add the olives and stir until heated through. Season the chicken to taste again with salt and pepper and serve with a side of roasted potatoes. Serves 4.